What happens when you bring together different stakeholders to talk about the intersections of sport and diplomacy? Dynamic conversation and lots to think about! 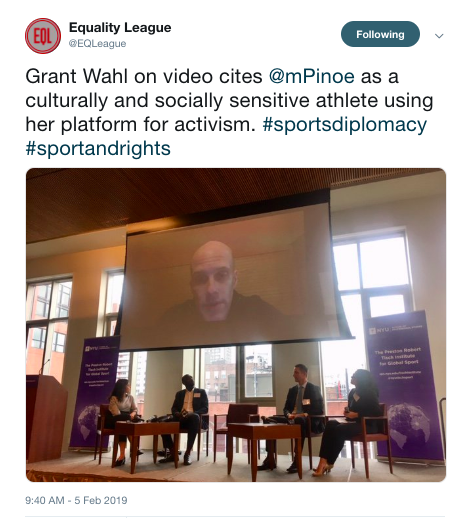 I produced and helped moderate the February 5, 2019 “The Power of Sport and Diplomacy” event hosted by NYU’s Preston Robert Tisch Institute for Global Sport in partnership with two groups I’m affiliated with: France-based Sport & Démocratie, and the Centre for International Studies and Diplomacy, SOAS University of London. The idea behind the event was to unpack the concept of sports diplomacy beyond the realm of academia and the policy-making world, and to explore different ways that many in and around the global sports world are already engaging in and thinking about the nexus between sports and diplomacy. 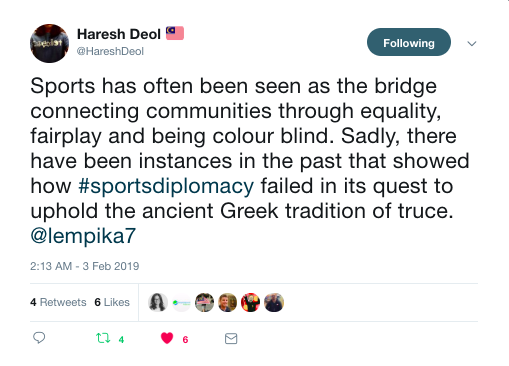 And, given the producer’s prerogative, I ensured that #hoopsdiplomacy was fully integrated into the conversation as so often the sports diplomacy limelight is dominated by the Olympics, football (soccer) and the FIFA World Cup. Roundtable One, “The Power of Communications in Global Sport,” looked at a variety of ways that those in and around the global sports world are engaged in different forms of sports diplomacy as they represent, communicate, and negotiate as part of their work. With perspectives from Sam Marchiano (NYU), Chris Dial (The Basketball Embassy), Stevy Worah-Ozimo (Stevy Worah-Ozimo Youth Academy), and Grant Wahl (Sports Illustrated & Fox Sports), we picked apart the role of communications and media, especially social media, the significance of symbolism, how values and ideals communicated by one nation’s athletes have new potency on their international counterparts. Roundtable Two, “The Future of Sports and Diplomacy,” examined how sporting mega events are theaters for sports diplomacy and how non-state actors like leagues and high profile athletes are able to sometimes accomplish objectives that diplomacy alone cannot. My Sport & Démocratie co-directors for sports diplomacy Dr. Hakim Zermouni and Yousef Ouldyassia moderated this roundtable, which included fascinating testimony from Amadou Gallo Fall (NBA Africa), Cameron Myler (NYU), Jérémie Bréchet (Sport & Démocratie), and Dr. J Simon Rofe (Centre for International Studies and Diplomacy, SOAS University of London). 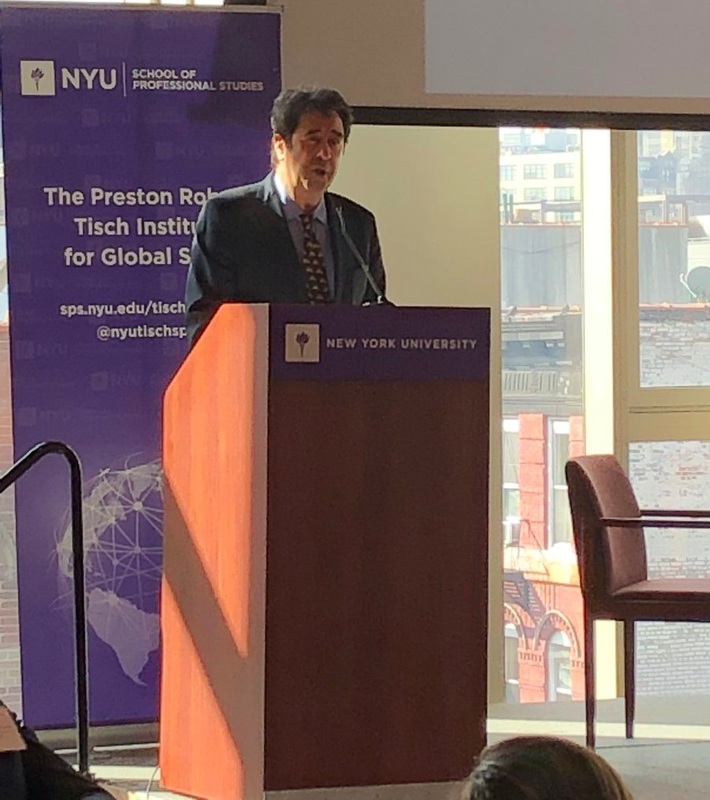 Our keynote, “Sport at the Service of Humanity: Do More,” was given by Dr. Allen Hershkowitz, founding president of Sport & Sustainability International and the New York Yankees’ Environmental Science Advisor. If you never contemplated the role of climate change and environmental responsibility in the equation of sport and diplomacy (or global sport more generally), then you should listen to Dr. Hershkowitz’s talk as they’re important elements. In recognition that any conversation about sports diplomacy should have plenty of international perspectives, we were able to tap into our network of #sportsdiplomacy thinkers, practitioners, and friends who are actively engaged in initiatives elsewhere in the United States and the world. 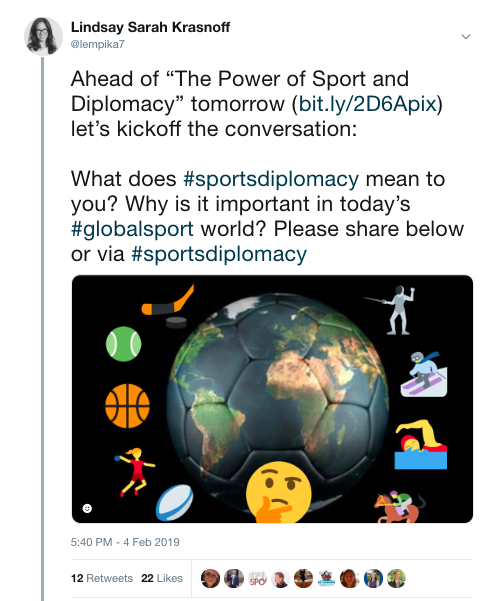 I kickstarted the #sportsdiplomacy conversation on Twitter with a call to arms: what does sports diplomacy mean to you? You can click on my Tweet (below) and see some of the different responses we received from France, Australia, Pennsylvania, China, Malaysia, and beyond. This online discussion highlighted how there’s no one-size-fits-all for what a sports diplomacy initiative looks like, but that we all agree on the importance of sports diplomacy in our global sports world. 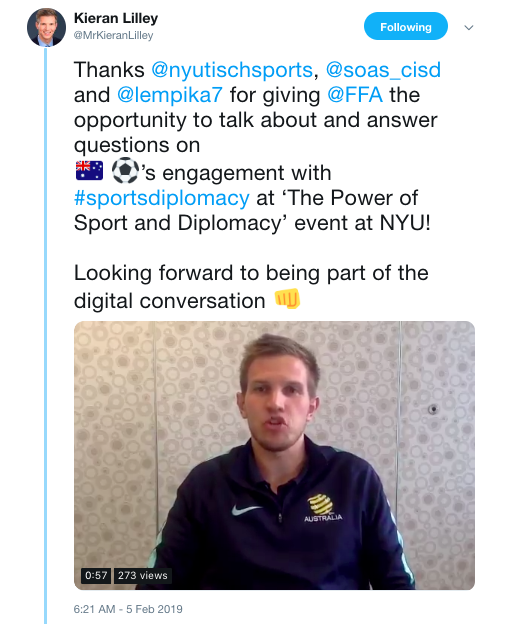 Kieran Lilley of the Football Federation of Australia weighed in on how the FFA engages in different sports diplomacy initiatives and their work aligning with the Government of Australia’s recently launched Sports Diplomacy 2030 program - you can watch his video by clicking the Tweet (left). Naturally, there was a robust online Twitter conversation leading into, during, and after the event. 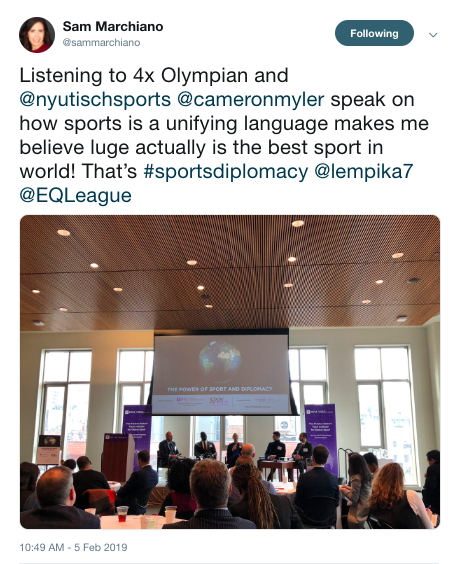 Many thanks to our amazing friends at The Equality League (@EQLeague) for live tweeting the event alongside NYU (@NYUtischsports) with engagement from @NBA_Africa, @NBA, @PowerOfSport, myself, and others. You can click here to follow the #sportsdiplomacy discussion. While many were unable to attend this event in person, we were able to record the proceedings and broadcast them via Periscope. You can click the below images/links for the broadcasts. Many thanks to NYU’s Institute of French Studies for sending one of their students from my alma mater to help with this! Opening Remarks and Roundtable One, The Power of Communication in Global Sport. Roundtable Two, “The Future of Sport and Diplomacy,” and Keynote “Sport at the Service of Humanity: Do More” by Dr. Allen Hershkowitz. A huge round of thanks to the entire team at NYUSPS Preston Robert Tisch Institute for Global Sport, the Centre for International Studies and Diplomacy at SOAS University of London, and the Sport & Démocratie team. I’d like to especially thank my colleague and teammate Hakim Zermouni, who not only helped shape the roundtables and added his expertise, but also helped bring this event across the finish line. Merci beaucoup!